A window valance brings elegance to any room while performing a valuable service—hiding the rods and brackets that support curtains and blinds. 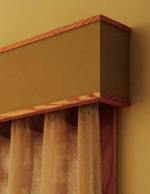 Your wooden valance can be finished in a number of different ways, from paint to stain to wall paper borders. Use our plan to build your own. Wood and/or Supplies needed: We used birch plywood and oak for the trim, you can use a wood of your choice.